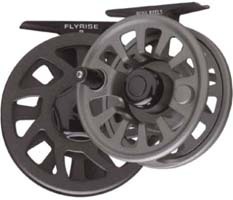 The Flyrise is a large arbor fly reel that is built around the award winning Evolution® LT drag system. This is pretty impressive considering that the Evolution LT sells for more than twice the price of this incredible series! The drag adjustment is precise and sensitive - capable of protecting the lightest tippets even when battling world-class fish. To guarantee the level of dependability anglers have come to expect from all Ross products, the Flyrise series has been designed with a triple redundancy drag system, providing three backup systems to ensure dependability under the most demanding conditions. 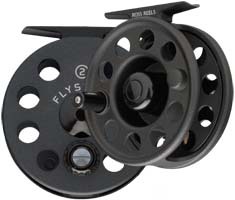 The Flystart is a large arbor fly reel that is affordably priced, yet built with the same commitment to quality and performance as all Ross reels. The gear-to-gear drag is a low maintenance, high performance system that is dependable, smooth and has a wide range of adjustment. And don't be fooled by the price. This reel is everything a budget-minded angler needs to land the fish of a lifetime. The Flystart series is coated with our proprietary AGP finish. This coating is incredibly strong and substantially more durable than any finish applied to competitive reels. The Flystart is a great reel for the first-time fly fishing participant that demands quality, but does not want to spend a fortune gearing up to fish.